The muscles of the cat are organized into major groups. For the purpose of a basic anatomy class, only the easily visible superficial muscles will be looked at. Muscles are held together by connective tissue called fascia, which appears white in color on the specimens. The fascia also serves as a boundary marker between muscles. At this point, dissecting equipment is not really necessary. The goal is to massage and separate the muscles so that you can identify each one. A probe or forces may be useful, but you definitely do not want to be cutting anything at this point. 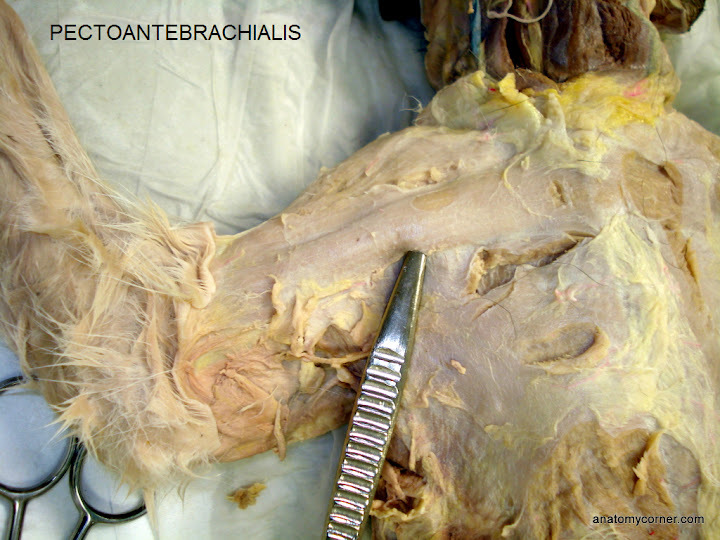 Pectoantebrachialis – this muscle forms almost a straight line across the top of the chest. Pectoralis major – forms a triangle just under the pectoantebrachialis. Pectoralis minor – a secondary triangle just below the pectoralis major. Xiphihumeralis – extends from the armpit of the cat to the center of the chest where the xiphoid process of the sternum rests. In the photo below, the divisions have been marked for easier viewing. Next, lets focus on the muscles of the cat’s forearm. The biceps brachii and the triceps brachii are the two main muscles of the forearm, but the fascia of the arm makes it difficult to distinguish where one stops and the other starts. By using your fingers, you can gently pull apart the two muscles. Also, the names of these muscles relate to the number of “heads” or attachment points. Biceps have two attachment points, and the triceps have three attachment points, two of which are easy to identify by just separating the muscle. 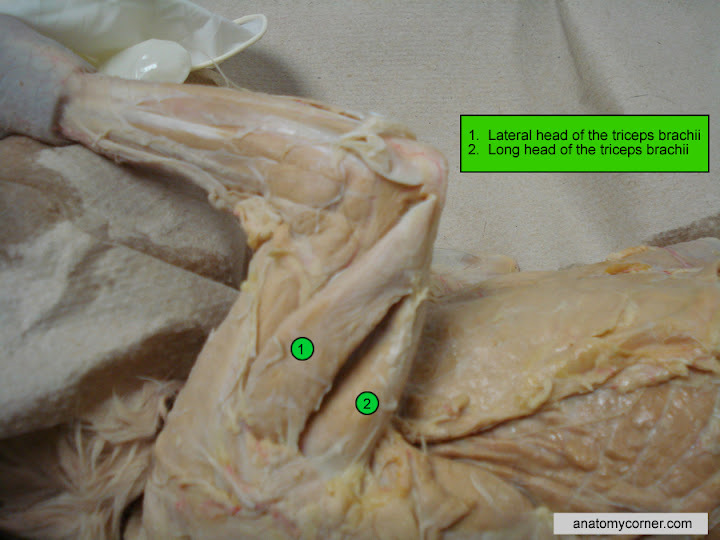 Shown below is the long head of the triceps and the lateral head of the triceps. The biceps brachii are on the other side of the foream, and lie underneath the cat’s shoulder muscle, the clavobrachialis (in humans, we usually refer to this muscle as the deltoid, due to its triangular shape). Located at the neck of the cat is the sternomastoid. This name reflects the associated attached bones for the muscle – sternum and mastoid process of the skull. The muscles of the lower forearm can be separated and observed. There are many of these flexors and exensors that operate the cat’s ankle and paws (claws). For our purposes, we will not be identifying them individually. More photos and images can be viewed by clicking on the Cat Muscle Gallery. Next section: Muscles of the back and Legs.